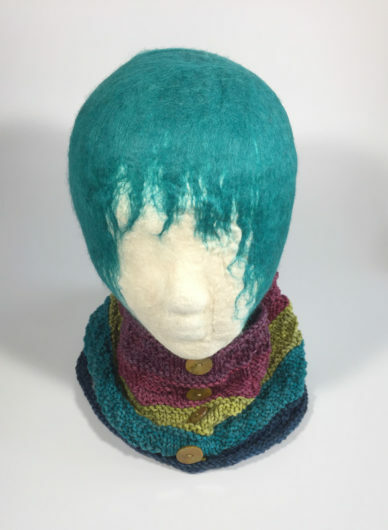 Isn’t BlueHairFelted head pretty? (GlassHead is jealous that her competitor gets top billing today). Blue Hair is wearing Rainbow Road, by Jenna Krupar. Mine was knit from a kit that contained 5 mini-skeins of Frabjous Fibers’ March Hare, an Aran weight. 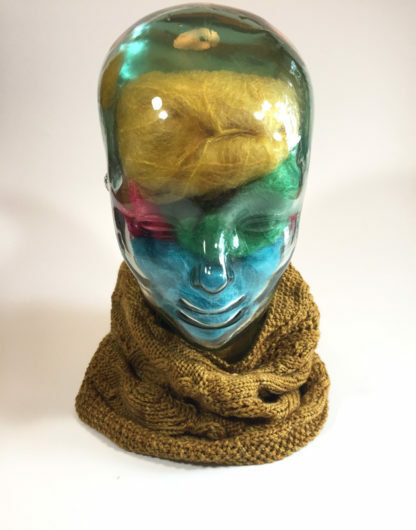 March Hare is a 100% merino. It’s next-to-the-skin soft. Here’s a closer look. It’s actually a sampler cowl, worked in simple knits and purls patterning. Especially in Aran weight, you’re finished so quickly there’s no time to be bored. That’s a fake button band. 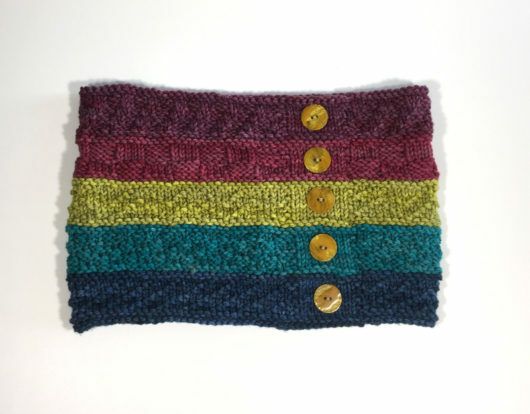 Normally I’d just continue the patterns over the stitches of a fake button band. But, I saw this cowl knitted up at a local shop and decided it worked well. I chose very thin, lightweight buttons. They won’t weigh the cowl down. I decided to keep this one for me. So, nieces, this one won’t be in the holiday choose-your-gifts extravaknitza. This one is for me too. GlassHead has modeled this twice before for you. It’s Heather Anderson’s Turtles’ Journey Cowl. 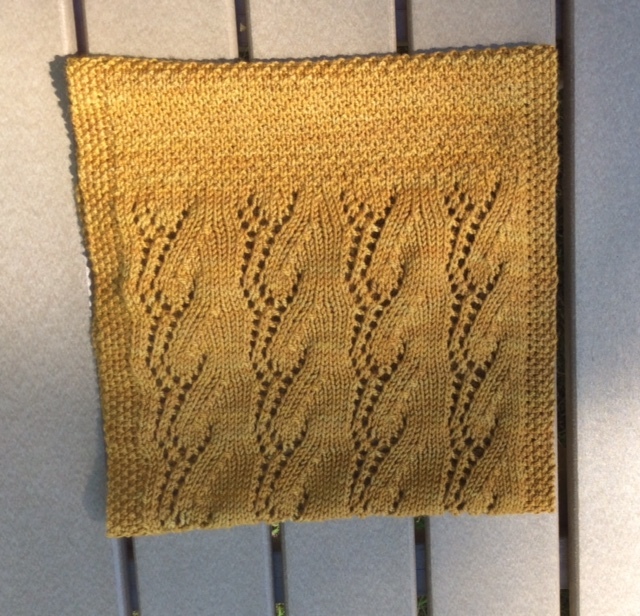 I knit this new one in Michigan’s-own Yarn Hollow Tango, an 85% wool,15% silk DK weight. The way GlassHead is wearing it, it’s a little hard to see the story. These photos show the turtles’ journey through the dangers of the sand into the relative safety of the water. Knitting the sand, well not too exciting. 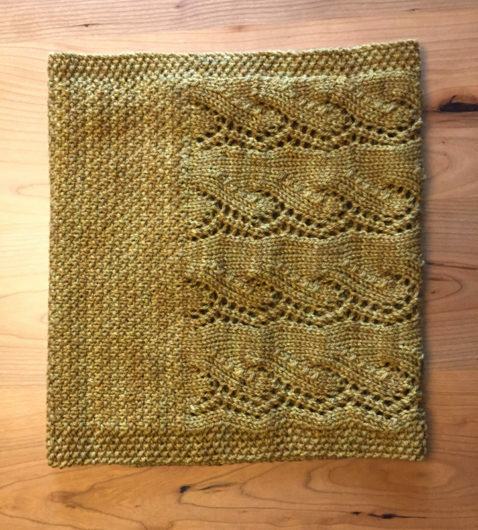 The waves are an easy lace pattern. And the turtles? Well the turtles are some of the most fun a knitter can have. Watching the bodies form is lots ‘o giggles. GlassHead gets a far-off, starry look in her eyes as she sits on my dining room table, staring out at Long Lake. I told her, no sea turtles here. But we’ve got snappers, painted turtles, and the occasional (OK, twice seen) Blandings turtles. She’s not getting the finer distinctions. 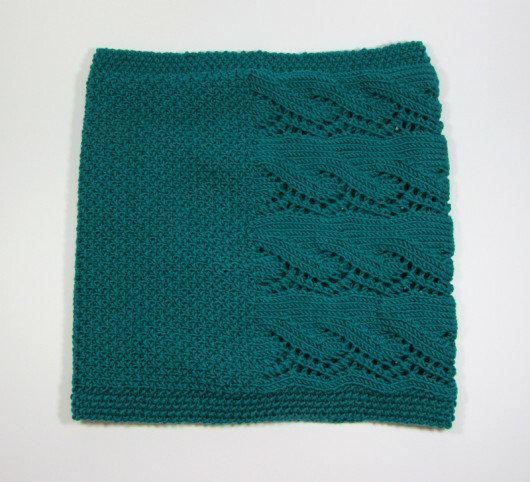 This is Heather Anderson’s Turtles’ Journey Cowl. 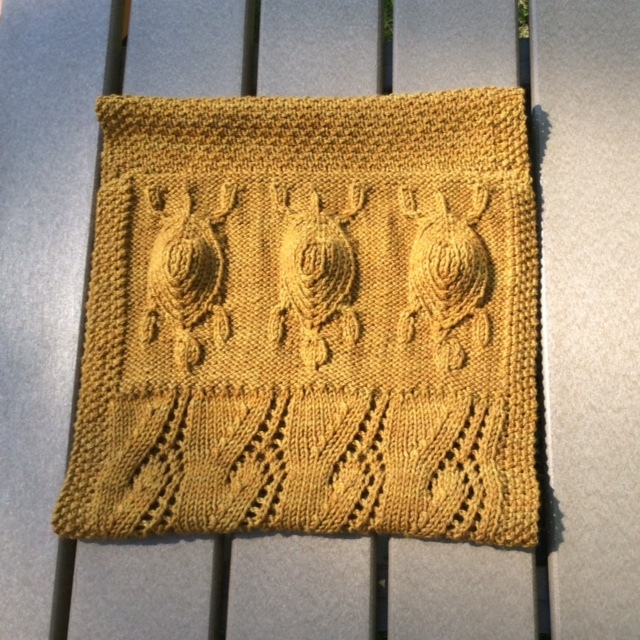 Quite the little knitting story, as the turtles leave the sandy shore and head for the water. 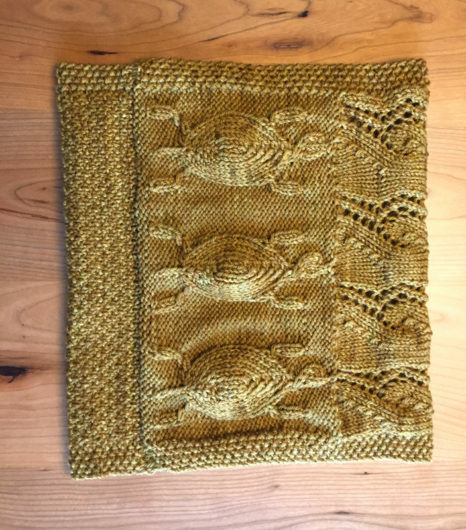 Anderson, learnsomethingnew on Ravelry, recently ran a Turtles’ Journey knit-a-long. 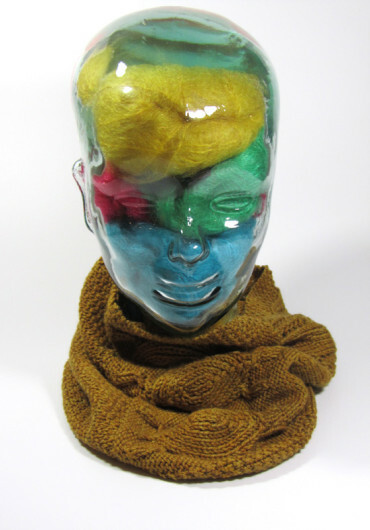 Knitters worked on this cowl, or the hat in the same series, or on the shawl or blanket in the same design. 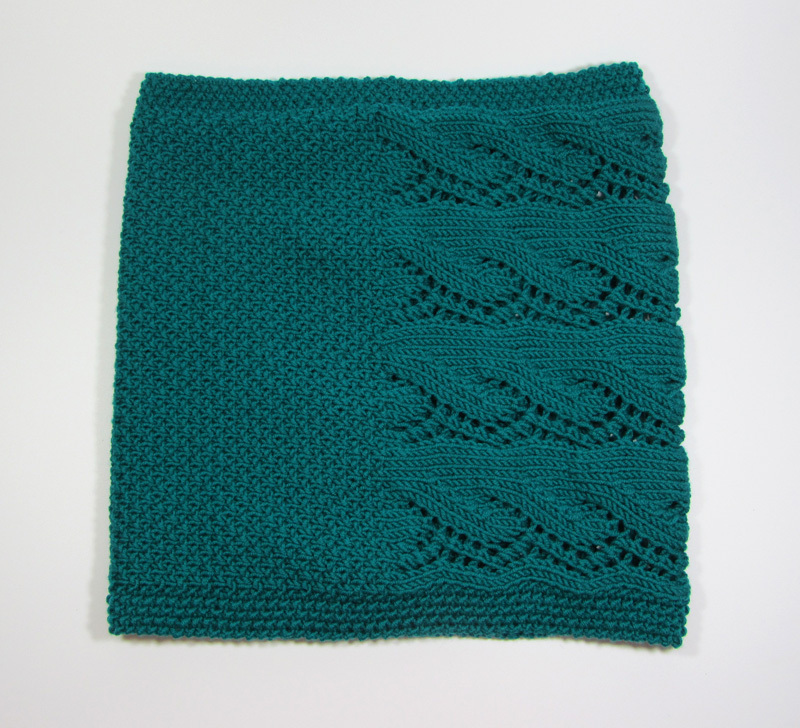 And, since the KAL, another shawl–Turtle Beach–has joined the family of patterns. The cowl was a fun knit. You start with a provisional cast on, get the harder section done first (the turtles), move on to the waves, and then to the sand. A row of Kitchener and your end joins the beginning. Full circle. Mine is knit in Michigan’s own Yarn Hollow, Tango. Tango is a DK weight wonder, with 85% merino and 15% silk. 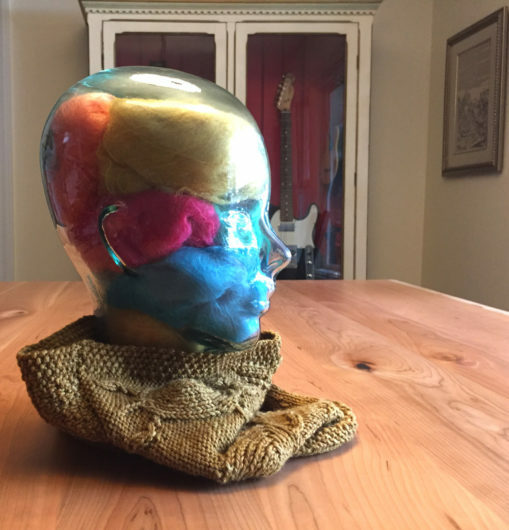 Here’s my glass head showing it off. I couldn’t knit just one. This next cowl is knit in Plymouth Yarn DK Merino Superwash. Turtles are a wonderful part of our life on Long Lake. 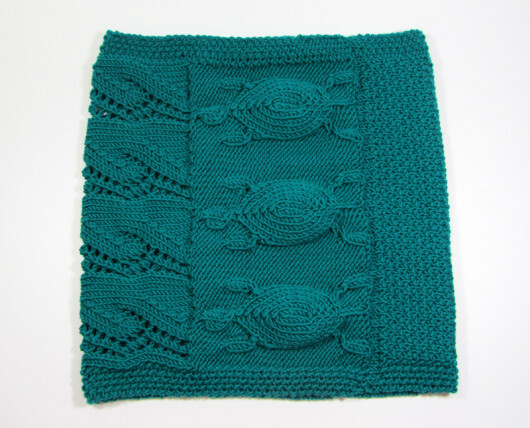 What a hoot to be able to combine my interest in turtles with my obsession for knitting!